NEW Top Dog Slots - Get up to 500 Free Spins! 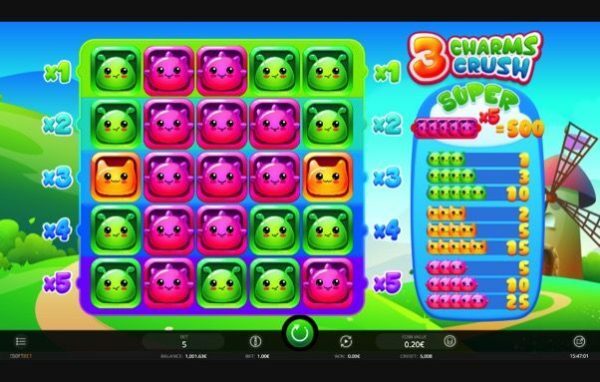 If you are on the lookout for a slot game with a difference that may have lots of colours, noises and excitement then 3 Charms Crush may be just what you are looking for. This creative and innovative slot game will keep you really engaged as the playability on this game is just awesome. This is not any conventional slot game and 3 Charms Crush Slot is a little different from your conventional slots. You will find this slot game on sites such as Top Dog, WTG Bingo and Cheers Bingo therefore there is plenty of opportunity for you to try it out. Continue reading on further on this 3 Charms Crush Slot review in order to get the full lowdown. When it comes to colourful and innovative designs then this slot game has it all. You definitely won’t be bored whilst pressing spin on this game. It is very different from your normal classic or video slot game and this 5 line game has rolling characters that will turn on every spin. This actually looks more like a game you would download from the app store therefore definitely appealing to those who are looking for something a little bit different. You will find charms of different colours being revealed and clearly the object of this slot game is to spin as many of the charms of the same colour next to each other. iSoftBet are the developers accountable for bringing out this slot game along with others such as Stacks o’Gold and Beetle Jewels. They are certainly not a stranger to bringing out innovative slot games and their reputation is extremely credible. You will find that there are a line of additional slots in the pipeline from this developed ready to be released mainly due to the fact that each of the ones they have released at the moment at incredibly popular and the sites are crying out for more. The 3 Charms Slot mobile capability is in place so that you can play either on your desktop or mobile device. Even on an iPad or similar, you will find that the sounds and graphics are top class. Get as many of the charms of the same colour together in order to get a win. On the left of the slot game you will see the multiplier where which can be added to any win on that area. The multipliers are probably the key to actually making a significant indent to your account balance and win anything credible. If you manage to get 5 of the purple charms in a row and you will automatically receive x20 win. This is clearly one to look out for and hopefully you’ll be laughing all the way to the bank! If you are expecting to see free spin bonuses or features then you will be disappointed. This site does not have these and relies on the pay out from the normal spins and multipliers to really keep the player engaged. Despite not having a specific bonus there is clearly lots of activity and opportunities to win quite a handsome amount of money when playing normally. If you are on the lookout for a slot game with different features, scatters or free spins then this one is not for you. You will however require to be prepared for a slot game that has bucket loads of excitement and energy. Although it does not have a specific bonus feature, do not let that put you off as the normal play on this game is so different from your conventional slot you will be playing for hours.